More fun with things you would probably just throw away for Handmade Monday. Even before it was cool to recycle and reuse I always saved things and did other things with them. No really. I don’t know why, I just always hated to throw things away if they might possibly be useful. Of course, that probably also gets into the realm of pack rattedness. But, we really do just toss things into the trash in far too cavalier a manner. I’m not making a political statement, just a statement of fact. And I’m as guilty as the next person. But I do love to make something from “trash”. This is another project from that really wonderful paper mache recipe. I decided it would be great to make something without having to buy a form to put it over, so I imagined using throwaway cardboard from packaging. I used a box that I retrieved from the recycling bin. The most difficult part was cutting the hole in the middle, however I did a pretty fair job. But, it’s boring to sit here and read about that, let’s get on with it. 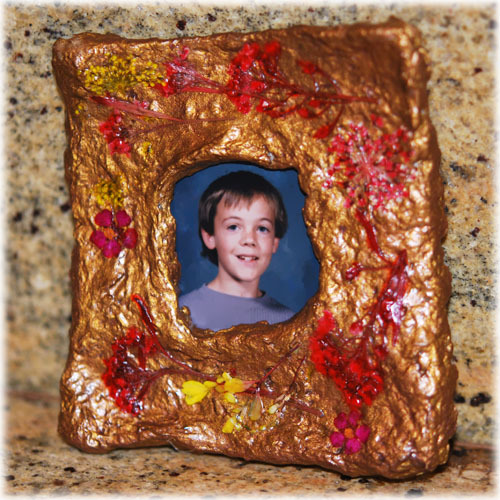 Head to Make it and read how to make your own Little Gold Frame. And don’t forget to check out all of the awesome things everyone is doing for Handmade Monday. It’s such a great and diverse crew of crafters, there’s pretty much something for everyone! I’m going to see your tutorial ! and happy birthday again ! Oo your frame is very different, I like it. Thank you all for checking it out. The problem is most of us don’t have space to save everything. But I keep a box of some of the waste paper to use for making paper (eventually I will do a tutorial on this, it’s very easy!) and a few other things I save. I do some stuff outside too, Jan, especially messy stuff like glass and grouting!